Recovers deleted messages directly, from iCloud, and from iTunes. Compatible with all iOS devices (even of the latest iOS versions). 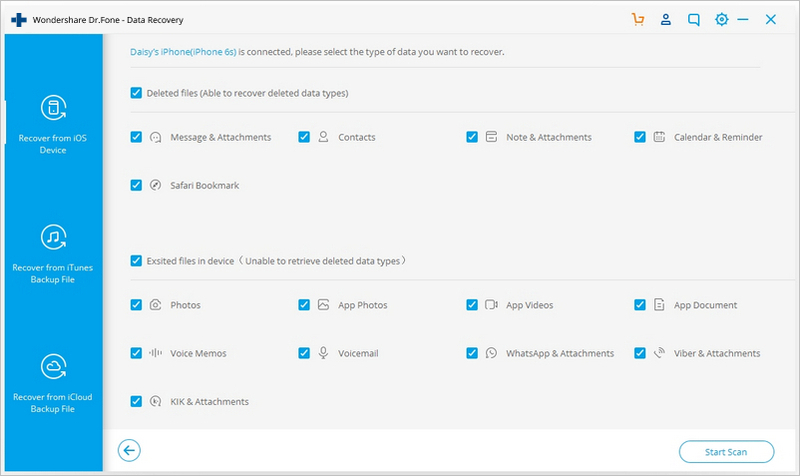 Allows to preview and selectively recover deleted messages and more. Message recovery does not affect existing messages on iPhone. Usually, we all tend to clear out unwanted messages from time to time in order to free up storage on our iPhone. And at times, we do face accidental deletion of messages or other data, be it due to unintentional deletion of important messages along with junk while trying to free up space, or due to other issues like failed iOS update, iOS firmware crash, malware attack and device damage. Thereby, recovering the deleted text messages from iPhone becomes imperative. So, find text messages on your iPhone missing or have deleted text messages on your iPhone accidentally? Keep your shirts on! You can fix it! But keep in mind: the sooner, the better result you'll get. Otherwise, you'll never see these deleted text messages again. Warm Tip: Here comes the long-awaited Messages in iCloud feature in iOS 11.4. There are many solutions to recover deleted text messages on iPhone, and they each function properly only in a specific recovery scenario. 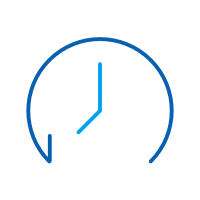 Opting for the most suitable solution is the key to message recovery success in a short period of time. dr.fone - Recover (iOS) is a professional iPhone recovery software that tells you how to retrieve deleted messages on iPhone. It offers you three options to recover deleted text messages: recover messages directly on iPhone, extract iPhone messages from iTunes backup and retrieve iPhone text messages from iCloud backup. To recover deleted text messages directly from iPhone, firstly connect your iPhone to your computer. Then run the program and click on "Recover". Choose "Recover from iOS Device" from the side menu on the right. Check "Messages & Attachments", and click on the "Start Scan" button appearing in the window to scan your iPhone. When the scan is complete, you can choose "Messages" and "Message Attachments" to preview all of the found text messages one by one. Then selectively recover the items you need to your computer or device. How to Download Text Messages from iPhone to PC/Mac? If you have ever backed up your iPhone in iTunes before you got the text messages deleted, we can use dr.fone - Recover (iOS) to analyze the iTunes backup file and retrieve the deleted text messages easily. This function can help you extract text messages selectively, so you don't need to restore your iPhone with iTunes. Choose the recovery mode of "Recover from iTunes Backup File" from dr.fone - Recover (iOS) tool. 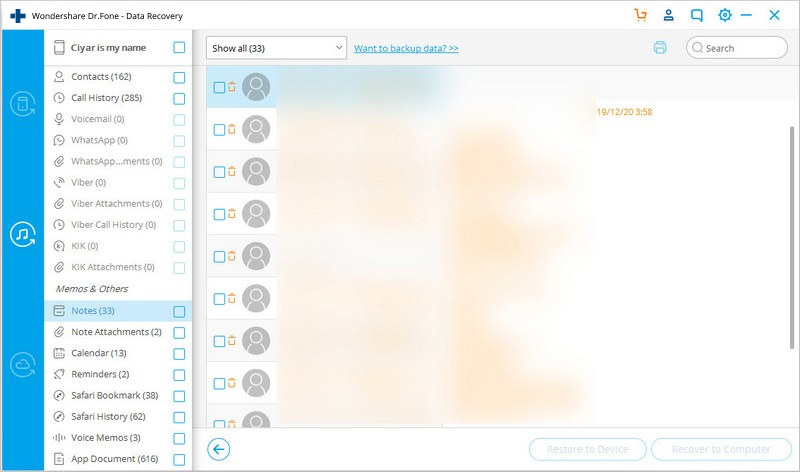 Then select the backup you want to recover text messages from in the list, and click on the "Start Scan" button to extract the backup content. All backup files existing on your computer are available for extraction. The scan only takes you a few seconds. After it, you can preview and recover any messages in the menu of "Messages" and "Message Attachments". Recover the selected messages to your computer or iPhone. One of the drawbacks of iTunes and iCloud backup is that we are unable to access one specific data in the backup. If we want to get some data backup from iCloud backup, we need to restore the whole backup file. In such cases, dr.fone - Recover (iOS) comes very handy, as it can help you recover one specific text message from iCloud backup and restore it to your iPhone easily. First of all, switch to "Recover from iCloud Backup File" and sign in your iCloud account. Once you're in, you can begin the downloading and extracting work. Never need to worry about your the security of your account. 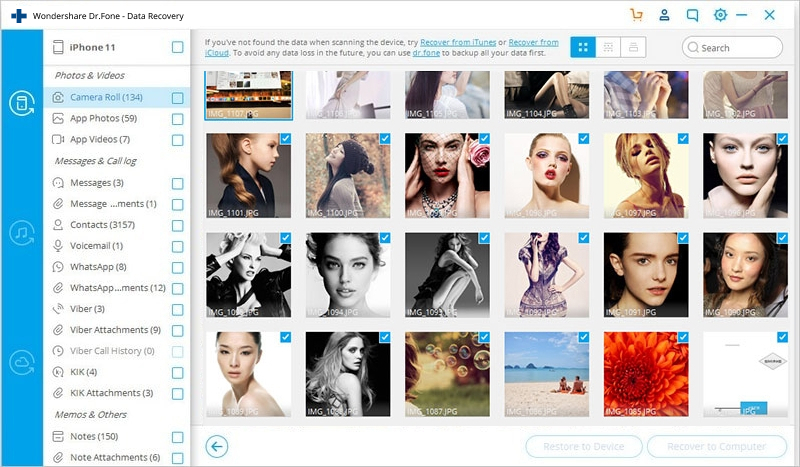 Wondershare won't keep any information of your account or data during your sessions. Once you're in, you can see a list of all your iCloud backup files under this account. Choose the one for your iPhone, the latest one will be the best. 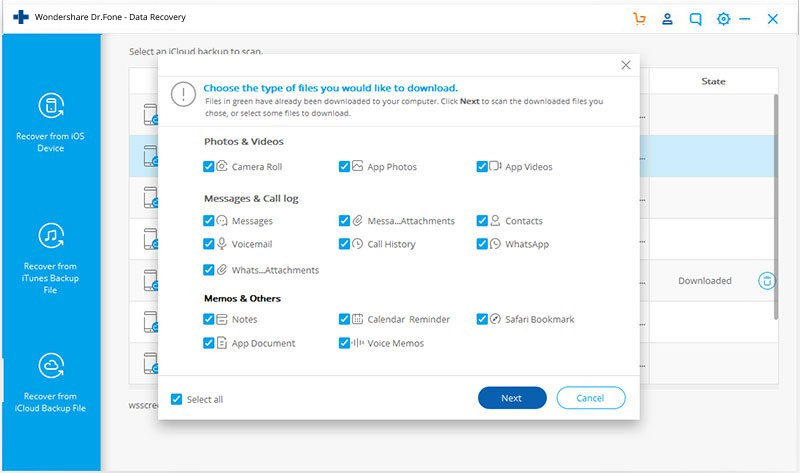 Check 'message' and 'message attachments' on the pop-up window if you don't want to download all data there. By doing this, it only download text messages and the attachments, saving you time. Of cource, you can choose all if you have a need. When the download is complete, continue to extract the downloaded backup file by clicking on the "Scan" button appearing on it. Since the backup file is unreadable, you have to extract it for reading and recover deleted iPhone messages from it. Once the scan stops, you can preview all the text messages in the iCloud backup file. Choose the text messages you need and click "Recover". 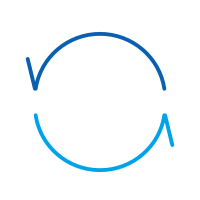 Both "Recover to Device" and "Recover to Computer" are available. I suggest you connect your iPhone with your computer through a USB cable and choose the "Recover to Device"'. It's more convenient for you to view the messages on your iPhone than on your computer. Though, the standard ways for recovering deleted text messages from iPhone are available but most people hardly know about all of them. 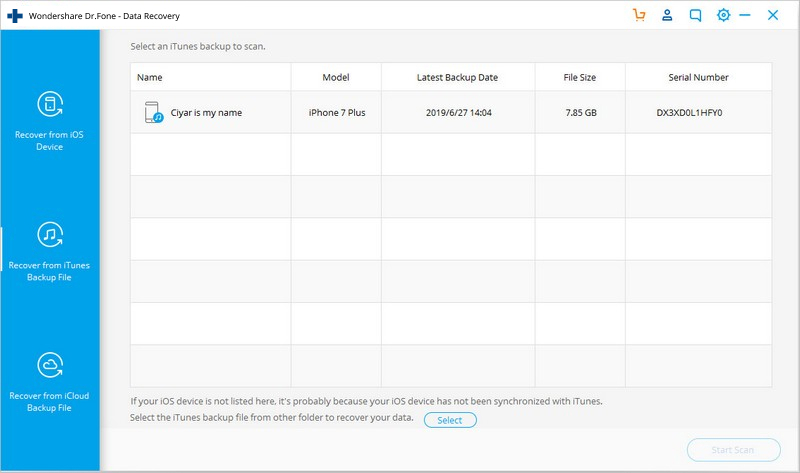 In case you have created an iPhone backup on iTunes or iCloud, you can easily perform iPhone SMS recovery from that backup. As a matter of fact, every time you sync the iPhone with your computer, a backup is created if the automatic sync to iTunes is turned on. iPhone SMS recovery is possible only if you have already created an iPhone backup. If you don’t regularly back up your iPhone data then this method mightn’t be the best way for you. As you know, every standard way do has certain limitations. Unless the prerequisites are met, you can’t get the best out of it. Here are some prerequisites/cautions that you must consider when you wish to recover deleted text messages on iPhone using iTunes backup. The downside of recovering deleted messages on iPhone in this process is it will overwrite all the existing files on your iPhone, including old messages. It can’t selectively recover deleted messages iPhone, as the entire backup is restored back to your iPhone. You need to upgrade to the latest version of iTunes, prior to retrieving the data or you may end up with several unknown errors. Use the same computer that your iPhone is synced with and has a backup on iTunes. Don’t connect to iTunes right after you know that messages were deleted, first turn off iTunes automatic sync on your computer then opt for restoring backup to your iPhone. Launch the most recent iTunes version on your computer and connect your iPhone. Now, choose your iPhone` from the iTunes interface. Next, click on ‘Summary’ tab and then hit the ‘Restore Backup’ button. You then need to pick the relevant backup file from the pop up message and tap ‘Restore’ to confirm your selection. After the recovery of deleted text messages on iPhone is completed, the text messages till your last backup will be visible on your iPhone. If you have backed up you iPhone text messages to iCloud, you can recover deleted text messages on iPhone from iCloud back files without any issue. Selective recovery of deleted messages on iPhone is not possible, as the entire device backup gets restored. It will even restore the other unwanted data that you may not wish to clog your device’s space with. Make sure to have a strong Wi-Fi connection on your iPhone to carry out iPhone SMS recovery. A fluctuating internet connection would prevent the recovery process and you might lose the text messages and data forever. Use the same Apple credentials you have used to create the iCloud backup. 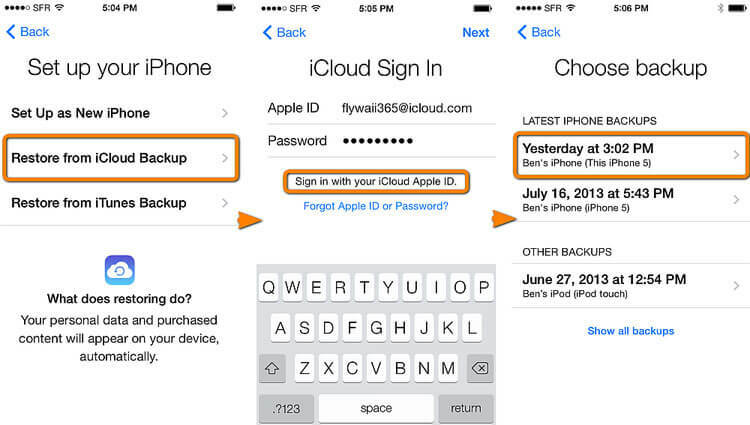 If you use another iCloud account then getting back your text messages won’t be possible. First, go to ‘Settings’ on your iPhone and then tap the ‘General’ section. After that hit ‘Reset’ button and choose ‘Erase All Content and Settings’. Let your device to reboot and when you reach ‘Apps & Data’ screen, tap on ‘Restore from iCloud Backup’ option. 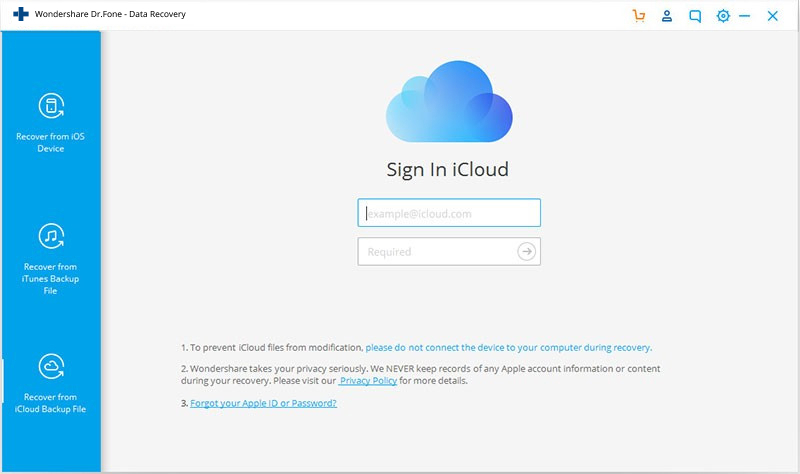 You will be prompted to sign in to your ‘iCloud’ account. Do that and select ‘Choose Backup’. If required confirm your selection. It is essential for iPhone SMS recovery. The recovery process will start soon after. If you still couldn’t recover deleted text messages iPhone, then approach your cellular provider or carrier. Usually a few of the carriers have the text messages on their server, and might help you in restoring them. Make a call to them and find out if iPhone SMS recovery is possible. If they are providing the recovery service then you can get it back on your iPhone. In case your service provider doesn’t cover the facility then you might have to look for an alternative. If you want to print your iPhone text messages, dr.fone toolkit - iPhone Data Recovery lets you do it directly without exporting them. You can choose to print the SMS on your iPhone, or in your iTunes or iCloud backup files. It's a one-click work. When the scan is complete, you can preview the the result of scaning. On the right upper corner, there is a print icon, and this is specially designed for text message printing. Click on the print icon and you will see the preview file as follows. You can adjust the width and height, and the size of the word. When everything is done, you can click on the printer icon on the left upper corner to begin the printing. This makes the iPhone text messages' printing pretty easy. Doesn't it? Well! When it comes to iPhone text message backup, we would recommend you to go for dr.fone – Backup & Restore, rather than running from pillar to post in vain. The best part about this exceptional tool is it doesn’t overwrite your old data and can restore the deleted messages of iPhone from your PC. The process doesn’t consume much time and can export contacts and text messages to your computer as well. You can even backup and export your WhatsApp messages, notes, calendars, call logs, Safari bookmarks, etc. to PC. Backup your iPhone/iPad on your PC with a single click. No data lost while backing up or recovering deleted text messages on iPhone along with other data. 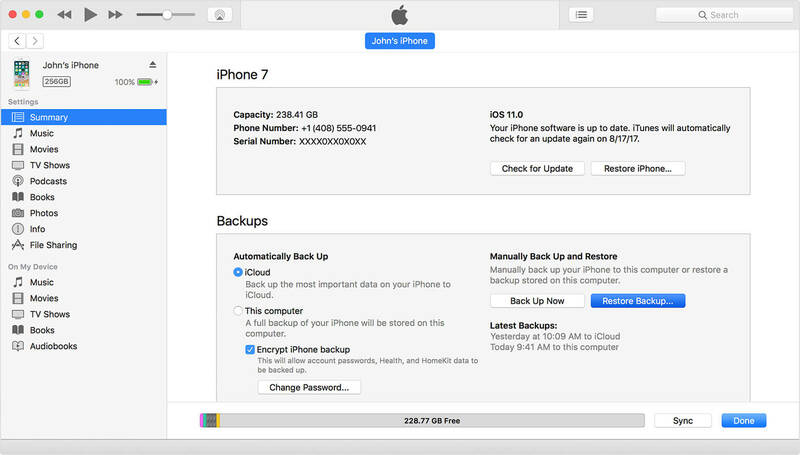 Preview and restore the backup data to iOS devices. Support all iOS devices, even the iDevices running on latest iOS 11 version. Backup and restore your entire or selected data to iOS devices. After going through the article, it is clear that you need to rely on a trustworthy software that can assist you in every way. Here comes dr.fone - Recover (iOS) for your rescue. Being an easy-to-operate solution, it helps you to save a lot of your time, money and of course the annoying trouble of recovering deleted text messages on iPhone. How do I retrieve deleted SMS from my Samsung phone? It only takes you 3 steps. Read the full guide here and get back your messages on Samsung phone now! This articles shows you the best way to undelete your text messages from iPhone, including the latest iPhone 6s Plus,iPhone SE.